"A hard-hitting, double clutchin', gut-wrenching, spine-tingling, bone-chilling, and imposterous set of songs and tunes, done in Peter's inimitable regressive bluegrass style ... truly neo-classic country music." "This album has such an intriguing mix of two styles that it almost evolved into its own style . . . From beginning to end, the album is full of surprises . . . The album is full of soul and personality. It is a fun album to enjoy and if you get the chance, you can get a feel of the west in southern music. " Peter Feldmann  vocals & mandolin, guitar * Mike Nadolson  vocals & guitar * David West  banjo * Tom Lee  vocals & bass * Tommy Marton  fiddle * Special Guests: Dave Richardson & "Ms. Francine"
Song text discovered as a poem in a men's magazine of the 19th century by Skip Gorman. 3 - Custer This is a combination of two items, the first being the traditional Irish piece, Garryowen, which was introduced to the Seventh Calvary by General Custer as its regimental song. The second is the song General Custer, which is from the archive of folk song at the library of congress. 4 - Grub An adaptation of a traditional tune by Peter. The style approximates old time music in that more than one instrument plays lead at the same time, yet if follows bluegrass stylistic constraints in that each variation of the tune is different, with different combinations of instruments. 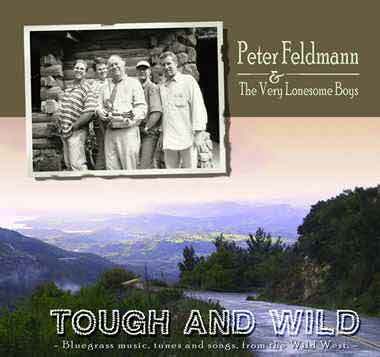 5.- Dear Old Southern Home Peter sings lead and overdubs the tenor part, while Tom Lee sings baritone to the yodel part. While Peter is Swiss, he notes that the yodel style there is quite different than bluegrass yodeling! 6 - When My Blue Moon Turns To Gold Again Mike: lead vocal, Tom Lee: baritone, Pete: tenor. 7 - Forked Deer David West sets aside banjo and plays guitar on this track. Mike: baritone; Tom Lee: tenor vocal. 11 - Jesse James "Ms. Francine": high harmony; Peter: lead vocal, mandolin, lead guitar; Tom Lee: baritone; Mike nadolson: rhythm guitar. Jesse was living in hiding under the assumed name of Howard' when he was shot in the back by Pinkerton agent Robert Ford. hence the "dirty little coward who shot Mr. Howard".